Transcatheter atrial septal defect (ASD) closure is now a widely recognized alternative to surgical closure for suitable secundum ASDs. We report closure of a large ostium secundum ASD (OS-ASD) which measured 40 mm on trans-esophageal echo (TEE) and was closed with a 46 mm device(Lifetech Scientific Inc., China). To the best of our knowledge, this is the largest size of the device used for closure of ASD till date. A 36-year-old man from Bangladesh had complaints of shortness of breath on exertion and palpitation. On examination, he had wide and fixed split of the second heart sound with a soft ejection systolic murmur over the left second and third intercostal space. 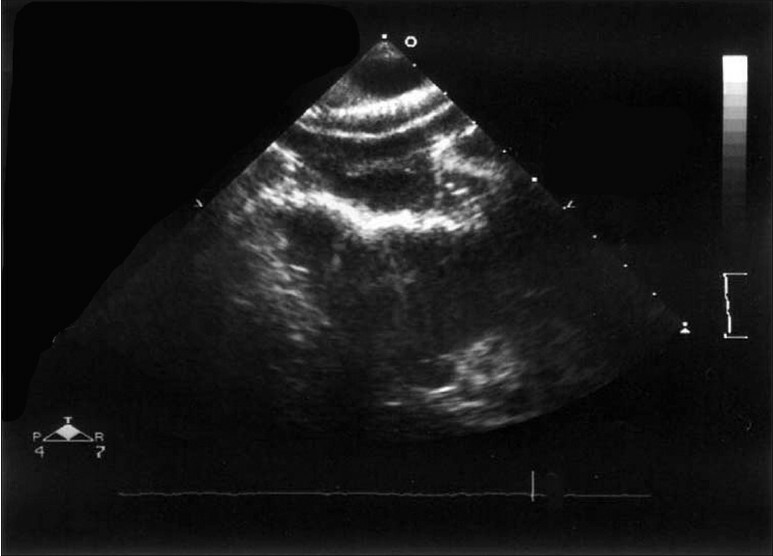 Trans-thoracic echo revealed a big OS-ASD measuring 38 mm with left to right flow and good rims of septal tissue all around with evidence of mild pulmonary arterial hypertension (PAH) and good biventricular function. The patient preferred a nonsurgical mode of treatment and hence an ASD device closure trial was decided upon. His precatheterization investigation profile was unremarkable. 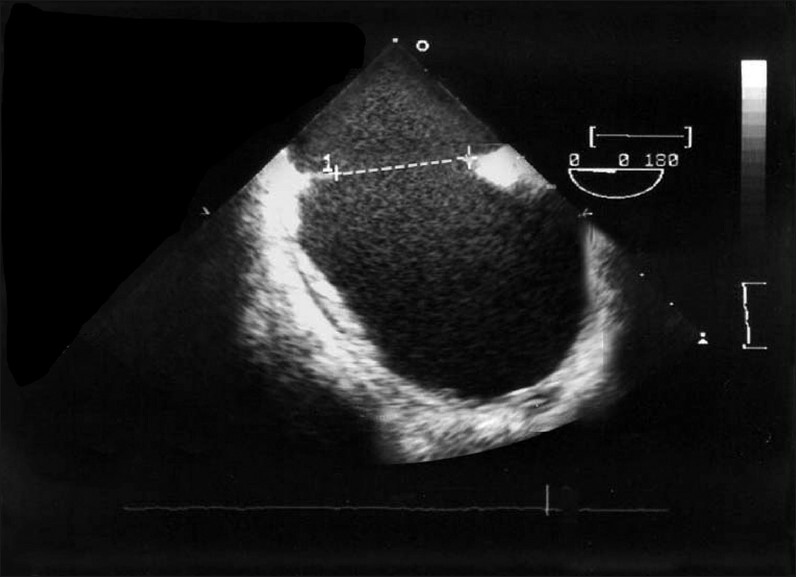 TEE in the cath-lab measured 40 mm OS-ASD with adequate septal rim all around [Figure 1]. The patient was intubated and 7 French (Fr) venous and 6 Fr arterial access was obtained. Initial right heart catheterization was done. Calculated Qp/Qs was 2.1:1. His pulmonary artery pressure was 37/19 (mean 23) mm Hg. A 46 mm (Searcare Lot No 10012711) device was loaded using the standard technique in a 14 Fr delivery sheath. The 7 Fr venous sheath was exchanged with the delivery sheath. The device was placed in the right upper pulmonary vein (RUPV) with part of left atrial disk in RUPV. First the right atrial disk was delivered following which the left atrial disk fell into its place completely occluding the shunt. Device placement was checked with TEE [Figure 2], which showed no residual shunt and unobstructed flow across both the atrioventricular valves and systemic and pulmonary veins. Left ventricular end diastolic pressure remained same at 8 mm Hg both before and after the device placement. The device was deployed under cine guidance. The patient tolerated the procedure well and was extubated on table. He was given unfractionated Heparin infusion for 24 hours postprocedure along with an oral combination of aspirin and clopidogrel which he was advised to continue for 6 month. He remained asymptomatic after the procedure; his device position was confirmed before discharge. On follow-up he became asymptomatic and TTE and TEE after the first and sixth months showed the device in situ without evidence of any complication. With the improvement in technology even very large ASDs can now be closed with the device. Devices of larger size are delivered by several techniques. Balloon-assisted, dilator-assisted device delivery are few frequently used techniques for larger size device deployment. In our patient the ASD device was delivered using the standard technique from the right upper pulmonary vein without using any balloon or dilator assistance. Though closure of OS-ASD with device is now a standard FDA approved mode of treatment, there are few well-known immediate, intermediate, and long-term complications. The reported significant complications of device closure include cardiac perforations, device malposition or embolization, residual shunts, vascular trauma, thrombus formation, atrioventricular valve regurgitation, aortic regurgitation, atrial arrhythmias, infective endocarditis, and sudden death. , Patients have to be on lifelong follow-up after device closure of their defect. 1. Fu YC, Cao QL, Hijazi ZM. Device closure of large atrial septal defects: technical considerations. J Cardiovasc Med (Hagerstown) 2007;8:30-3. 2. Amin Z, Hijazi ZM, Bass JL, Cheatham JP, Hellenbrand WE, Kleinman CS. Erosion of Amplatzer septal occluder device after closure of secundum atrial septal defects: review of registry of complications and recommendations to minimize future risk. Catheter Cardiovasc Interv 2004;63:496-502. 3. Schoen SP, Boscheri A, Lange SA, Braun MU, Fuhrmann J, Kappert U, et al. Incidence of aortic valve regurgitation and outcome after percutaneous closure of atrial septal defects and patent foramen ovale. Heart 2008;94:844-7.